Serving the Industry for over 57 years in Water Treatment, Wastewater Treatment, Pulp and Paper, Chemical Processing, Food Processing, and Pharmaceutical environments. 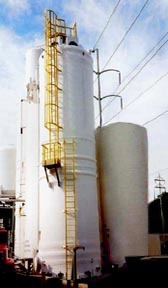 The Justin plant located in the Sussex County Industrial Airpark, Georgetown, Delaware, is one of the few in the industry which was specifically designed and constructed to build FRP tanks and equipment. Through the use of multi-station vertical and horizontal tank winders, Justin provides tanks with diameters ranging from 3 to 14 foot. Tanks are fabricated utilizing both contact molded and filament winding processes. Each tank is individually designed and fabricated to meet the user's specification. An extensive quality and testing program assures the user the equipment will meet its intended service for years to come. Justin equipment will be found in many industries with continued success. If you or an associate have a need, contact us. We will assist in all phases of your project from design and specifications through fabrication and delivery. Justin Tanks, Inc. through its commitment to quality and value, continues to be the forerunner in the Industry. FRPI certified, to assure you receive what you think you are buying!